Joy to the world, the Lord is come! This painting by Carol Aust (b. 1958) bursts with expressive energy to exclaim that ‘The true light, which enlightens everyone, was coming into the world’ (John 1:9, ESV). At the center we see Mary lifting her newborn baby up as the Light of the World. Shepherds with their sheep have a mixture of responses. One responds in wonder; the next, questioning. Another has open hands to receive the child. While another figure moves away from the scene suggesting that nothing out of the ordinary is happening other than one more birth in the world. Aust adds to the visual narrative the Adoration of the Three Kings, who look in wonder at the newborn babe. Although bathed in light streaming from the child, the person to the left of the first king seems more impressed by being in the presence of kings rather than the King of the Universe. Then there is Joseph, with open hands and arms, welcoming the child whole-heartedly even as he tenderly touches Mary. Intriguingly curled around the edge at the far left of the painting is a large figure filled with anxiety, holding back from becoming involved with the event he intently surveys, even as his garments seem swept by the wind into the central drama. 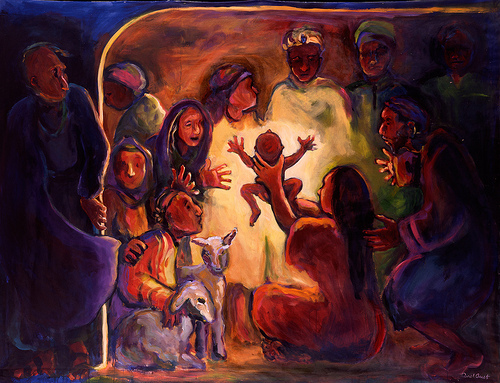 The reactions of the participants in the narrative serve to remind us that we respond in various personal ways to the birth of Jesus, whether we are conscious of this or not. Laurel Gasque is associate editor of ArtWay and the author of Art & the Christian Mind: The Life & Work of H. R. Rookmaaker.